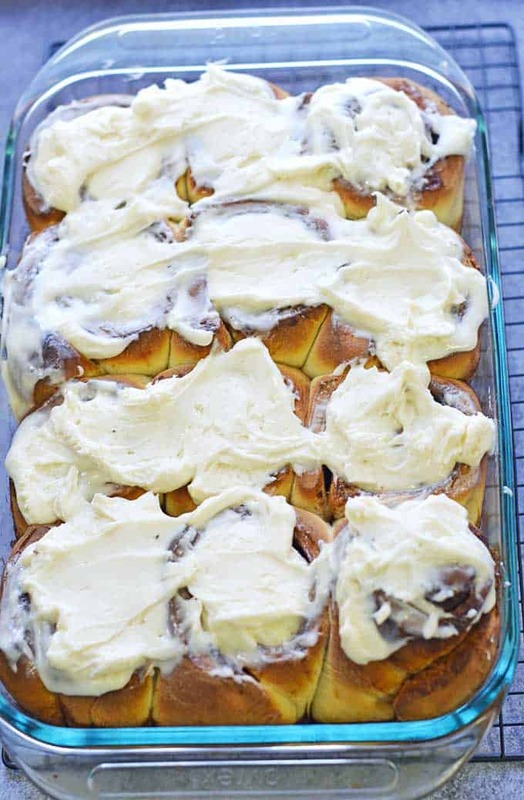 This Homemade Cinnamon Rolls with Cream Cheese Frosting Recipe is the perfect way to start the weekend! As I’ve mentioned in the past, I find it tough to eat breakfast during the week. However, on weekends and holidays, I really enjoy going to the trouble to making a nice homemade breakfast or brunch. One of our favorite indulgent breakfast and brunch foods just so happens to be this homemade cinnamon rolls with cream cheese icing recipe. Sure, you could hit up the local Cinnabon. But I find there is just something extra special about going to the trouble of making homemade cinnamon rolls. These homemade cinnamon buns are perfect to bake while opening presents on Christmas morning. They’re also a favorite for Easter brunch or even just because. I know a lot of people are a bit scared to work with yeast. We’ve all heard horror stories of going to all the trouble and ending up with inedible hockey pucks. I’ve certainly been there. Just take your time and go through the steps carefully until you get the hang of it. it’s really not something to totally stress yourself out over. Using a stand mixer or bread machine can take out a lot of the guesswork, but kneading can be just as easy with some practice. I’ve even shared several tips for using yeast to help make sure your rolls are a success. These rolls are made up of traditional cinnamon roll flavors that let the cinnamon flavor really shine through without being too potent. Of course, if you’re like me, the frosting is actually your favorite part. As always, you can change up the recipe to your liking. For example, I added raisins to the filling. I’d add them to the dough itself next time, though, so they don’t fall out of the roll so easily. You could also add nuts or instead of using cinnamon, opt for lemon or orange zest, which would also make a great addition to the icing. Homemade cinnamon rolls are a bit time consuming due to rise time if you’re like me and don’t like getting up super early. So, my super smart savvy tip is to make the dough, let it rise, then make the cinnamon rolls, place them in the pan, cover with plastic wrap and leave in the fridge overnight. You could also freeze them at this point. I then take them out of the fridge and leave on the counter to warm up and rise a bit more while I get ready and the oven preheats. Then, make the cream cheese frosting while the rolls bake or you can make it the night before as well. These cinnamon rolls do take a while to make but are totally worth it and will make you the star of your next brunch or gathering! Heat milk to lukewarm, between 100-115°F. Any hotter and the yeast could die. Once heated, pour milk into a large bowl or the bowl of a stand mixer. Stir or whisk in yeast until dissolved. Let sit for 5-10 minutes until frothy. If you see no bubbles, the yeast was either killed or may be bad and you'll need to start over. Add sugar, butter, salt, and eggs to yeast mixture and thoroughly combine. If using a stand mixer for kneading, add in the yeast mixture and 3 cups of flour to the mixer bowl and attach to the mixer with dough hook. Turn on to the appropriate dough setting and wait for the flour to be thoroughly mixed in. Add the remaining cup of flour, adding more, if needed, a tablespoon at a time, continuing to run the mixer until the dough forms a ball in the bowl and is elastic - about 10 minutes. If kneading by hand, add all 4 cups of flour and stir or mix with your hands until the dough has come together enough to knead. Place dough on a lightly floured clean surface and knead for 5-10 minutes until dough is smooth and elastic, adding more flour as needed to prevent sticking. If desired, lightly mix or knead in raisins and pecans. Lightly oil or spray a large clean bowl. Shape dough into a large ball, place upside down in the oiled bowl to coat, then turn right-side up, cover with plastic wrap or a clean towel, and leave to rise until doubled in a warm place 1 - 2 hours. Once the dough has doubled, thoroughly punch it down and then turn it out onto a lightly floured surface. Using a rolling pin, or pat with your hands, roll out dough into approximately a 16 x 21-inch rectangle (long side facing you), adding a bit more flour if it starts to stick. Spread softened butter all over the rolled out dough and then sprinkle evenly with brown sugar and cinnamon. Starting with the side closest to you, begin rolling the dough tightly to the top edge. Pinch the top edge to the dough roll, and then roll over the roll so that the pinched edge is now on the bottom. At this point, you can cut the rolls into whatever size you desire with a knife, unflavored floss or thread. I usually just use a serrated knife. Place the rolls into a pan that has been sprayed with non-stick spray. I find that the rolls bake up best in a 9 x 13 baking dish or 2 cake pans. Having the filling ooze out can be a common problem with cinnamon rolls and I find the best solution is to leave just a bit of room for the rolls to rise and double so they will be touching and supporting each other. Cover pan(s) of rolls with plastic wrap or a clean towel and allow to rise until doubled in size in a warm area - about 30 minutes to 1 hour. I usually make my cinnamon rolls the day before and stick the pan in the fridge at this point to slowly rise overnight. Then I take them out in the morning first thing while I get ready and let the oven preheat instead of having to get up at the crack of dawn. While rolls rise, preheat your oven to 400°F. Once preheated, bake the rolls for about 15-20 minutes, or more depending on how large you made yours, until golden brown. In the meantime, make the frosting by beating together the softened cream cheese, butter, sugar, vanilla, and salt. One rolls are browned, remove from oven and slather with frosting. You may want to let them cool a few minutes before frosting as it will melt. Cover and refrigerate any leftovers for up to 3 days. Frosted rolls can also be frozen. Rolls will reheat best in a dish covered with foil in a 350°F oven though can be microwaved for 30 seconds - 1 minute as well. 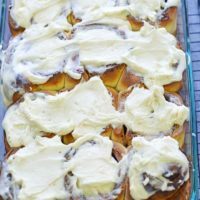 I hope you enjoyed this Homemade Cinnamon Rolls with Cream Cheese Frosting Recipe – be sure to check out our other recipes! In your Homemade Yeast rolls recipe, you mention in the ingredient part “if your making cinnamon rolls” can I use that recipe for this? I made the rolls and they are WONDERFUL! This time when I made them I put half the dough in the fridge and planned on making the cinnamon rolls, but this recipe is different???? Just wondering, thanks so much! I’m so glad you enjoyed the rolls recipe! Yes, you can use that dough in this recipe. I’ve doubled it a number of times just to make cinnamon rolls as well. The ingredients in this recipe are very similar, this one just uses a bit more butter and sugar for a slightly richer dough to stand up to the filling and icing. We love them both ways, though! I am trying this recipe now as I’m writing this comment. My dough is now rising in my garage beacuse it’s extreamly humid/warm in there. I’ll let you noe hoe the come out. Thank you for this easy recipe. They’re so good, Dawn. I can only make them rarely or I’ll totally pig out!